If we have lots of time and resources, we all can consistently make healthy and delicious meals. But what if time is short and our refrigerator is less than fully stocked? When we are using the HumanaNatura natural health system and following HumanaNatura’s OurPlate healthy eating model, limited time and ingredients are usually not a problem. Need proof? Check this six-ingredient or “sextet” salad meal! Our example HumanaNatura salad meal begins with a salmon fillet (#1) that is pan sautéed with sliced red onion (#2) and a few seasonings (garlic bits, Cajun powder, lemon, and black pepper). As the fillet cooks, we make a salad base and veggie mix of arugula (#3), sliced and quartered cucumbers (#4), cut orange pieces (#5), and whole grape tomatoes (#6). When the fish and onions are done, they are added still warm to the salad, everything is garnished with parsley, lemon, and black pepper, and the meal served immediately. Fast, delicious, extra-healthy, and super-easy, as always when we prepare our meals the HumanaNatura way! Tell others about HumanaNatura…natural modern life and health! Greetings from HumanaNatura at the equinox! In the natural year, we are now halfway between the extremes of light and darkness of the winter and summer solstices. Everywhere on earth, there is equal day and night, and a heightened balance or natural centering that touches many aspects of life. 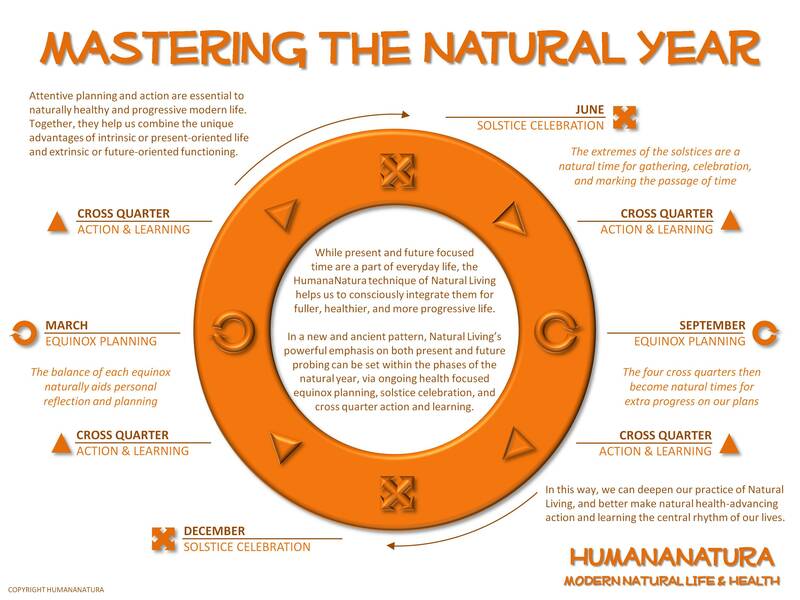 In the HumanaNatura natural health system, and as explained in our Mastering The Natural Year post and graphic, we encourage review and renewal of our Natural Life Plans during the twice-yearly times of added natural balance that are the equinoxes. This includes making changes to our plans as needed, and considering and revitalizing our commitment and actions toward progressive natural life and health more generally. If you have not yet created a Natural Life Plan to guide your use and expression of the third HumanaNatura technique, Natural Living, our links will take you to HumanaNatura’s planning worksheets and seven-step progressive planning process. Together, these free resources will help you begin more intentionally health-centered and naturally progressive life in the days and weeks ahead. Our newest member newsletter was released today as well, which is published eight times yearly in harmony with the natural year, providing updates on HumanaNatura’s resources, programs, and worldwide health campaigns. To receive future HumanaNatura newsletters and learn more about our global practitioner-advocate network, go to Join HumanaNatura. However you mark this equinox, we wish you new natural balance and progressive life and health!